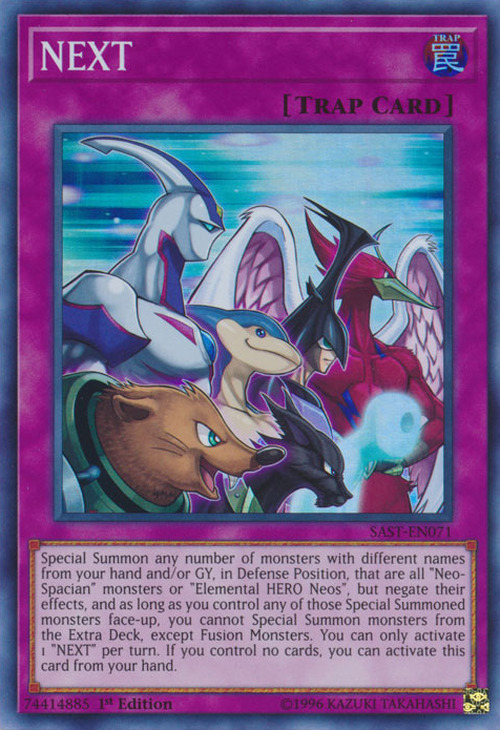 Special Summon any number of monsters with different names from your hand and/or GY, in Defense Position, that are all “Neo-Spacian” monsters or “Elemental HERO Neos”, but negate their effects, and as long as you control any of those Special Summoned monsters face-up, you cannot Special Summon monsters from the Extra Deck, except Fusion Monsters. You can only activate 1 "NEXT" per turn. If you control no cards, you can activate this card from your hand. This card is a retrained version of NEX. Its artwork is even similar to NEX, as it features all of the Neo-Spacians with the addition of Elemental HERO Neos.